Many people told me they use their ears for listening. Stefanos, a cook, needs his ears to listen to orders, and to listen to the sounds his food makes. Many people use their ears to listen to the people they work with. Their colleagues, their clients, the users of their products, their students. Willemijn added that listening is not enough: you have to observe as well. What people say they do is often not what they really do. Quite a few people I spoke to are hard of hearing, and in some cases even completely deaf. Marie calls herself Deaf, with a capital D. She was born deaf and she uses her eyes to read lips and to read sign language. Arnold has been turning deaf over the years. This doesn’t affect his work, it does affect his private life though. It gets harder to communicate in crowded places. Since Joost’s one ear is completely deaf he can not hear direction. Some of his students know this and use this to tease him with in class. Quite a few people do not need their ears for making. They work alone, on their own products, and the things they make don’t use sound. These are people like Kiki who makes things from stuff she finds on the street, or people like Titus who is a programmer, or Arnold who has been researching old Greek manuscripts all his life. A few people told me that sound does play a role in their work, while they don’t really need it. Joke listens to the sounds of the surroundings while she collects the stones and thingies. Later, when she is making her jewellery, she remembers the sounds of the waves. It’s not an essential part of her work, but it’s there. Diek is a sculptor. When a work is done it somehow has its own sound. All his sculptures have their own unique sound. Not literally. You don’t have to knock on them to hear it. They look like they have this sound. But this is something that happens after the fact, a side effect. It’s not something he creates on purpose. Dave and Harold, the two musicians I portrayed surprised me. They both told me they had never thought of their ears. For them it’s not about the ears, it’s about the hearing. Some people are deaf. Interfaces should not depend on sound. Some people listen to music while working. Sounds might be annoying. Objects look like they have a certain sound. I’d love to investigate this further. Can we use sounds to enhance interfaces? Are there sounds that are not annoying? This is mostly true. There is a direct relation between size and pitch: The larger, the more time it takes to complete a vibration, the lower the pitch. And the harder an object is, the brighter the tone. The simpler the shape, the more the sound rings. But you can play tricks. Violins were designed in an age that visual symmetry was thought to be important, but soundwise, a violin is not at all symmetric. 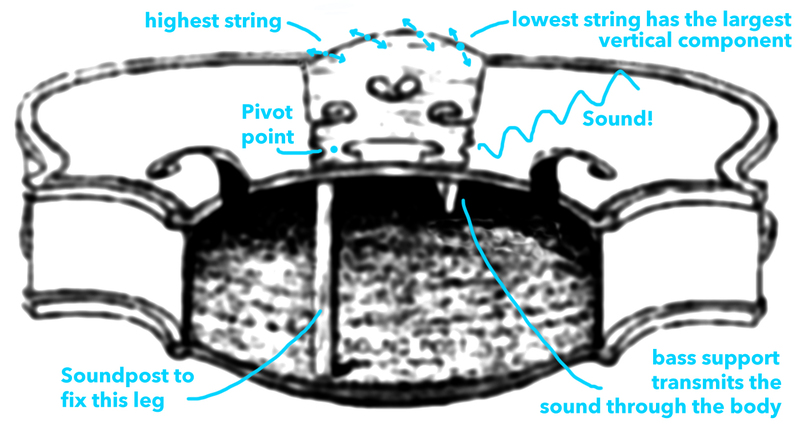 Due to the bowing, the strings move sideways, but for amplification in the wood, the vibration needs to be up and down. This is solved in the bridge. That is the unpainted piece of wood that supports the strings, and stands on two legs between the ƒ holes on the body. One of these legs is fixed and acts as a pivot, so the free leg will move up and down. This fixation is secretly hidden inside the violin, but you can spot it through the ƒ holes. It is no coincidence that this fixation is underneath the high string, and that has everything to do with the human (inner) ear. We have way more sensors in our ear for high pitches than for lower pitches. To overcome this difference in sensitivity, the high string runs over the fixed leg over of the bridge, while the the low sounding string runs over the free leg, causing a much larger movement in the wood than the high string. This makes the volumes of each string equal to our ears. This trick works for all instruments in this family, from the double bass right up to the violin. If you give up the need for a visual symmetry, you can design a violin that has a very different shape, but sounds the same. That’s fascinating! So from the looks of it a violin should make a different sound. I understand that objects make a certain sound. But something like colour doesn’t influence it, right? Yet still, when we see two violins that are exactly the same shape, yet one is bright green and the other is black, we imagine two different sounds. But what exactly we expect, I think that’s pretty hard to guess. That’s probably more a cultural thing.